When it came to selecting the first game to blog about in the Meeple Arcade series, it wasn't an easy choice. There are a lot of great games out there that I think you'll enjoy; each with their own merits. So when choosing the first title to include, I went with my gut. I went with a game that I have played over and over again. Not because I'm trying to unlock some alternate ending, or some crazy achievement; but because it's just that enjoyable. My first choice is, Infectonator! World Dominator. 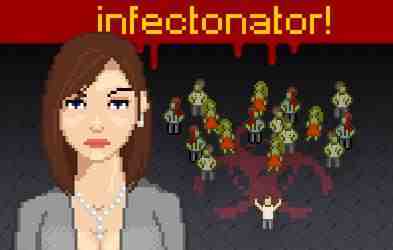 At its core, Infectonator! World Dominator is a very basic upgrade game. Every day you unleash a virus upon any one of the available cities that you have not yet destroyed; creating a horde of zombies. These zombies create other zombies, and you hoover up the cash left in the aftermath. You then use that money to enhance your virus, creating stronger, tougher, faster zombies. Rinse. Lather. Repeat. Despite the simplicity however, the game is extremely addictive; and really well pulled off. The art style is appealing, and a lot of thought has gone into the presentation of this game in general. Even to the point where the in game text showing you what your victims are crying out as they flee in terror from your creations is region specific. It's small touches like that which really make this game more than a sum of its parts. Different victim types create different zombie types, there are shout outs to survival horror classics, and many of the specialist zombie types are thematically linked to the place where you acquire them.. There also can't be too many zombie games featuring both Ronald McDonald and Colonel Sanders! I would highly recommend that you play the game using this link, else some of the site locked content (Greenland) will not be available. You also get a start up bonus for playing the game via this site too as an added incentive. If that's a little slow to load however, the game can also be played here, here, and here.